The more things change, the more they stay the same. Pan’s Labyrinth is without question the apotheosis of obsessions that have been boiling irrepressibly since the start of del Toro’s career. Set against the war-scarred backdrop of 1944 fascist Spain, it sees a young girl named Ofelia (Ivana Baquero) escaping the savage grip of her sadistic Nazi step-father (Sergi Lopez) as she discovers an ancient maze in the forest. 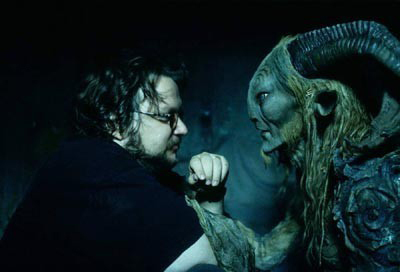 Deep within it waits Pan, (Hellboy’s Ape Sapian, Doug Jones), a mythical faun with the power to grant her immortality. Rich, enigmatic and beautifully rendered, del Toro’s magical-realist fable balances brutal war drama with the strange, fantastical adventure in Pan’s netherworld. And that’s the magic word. Pan’s Labyrinth is another triumph for the filmmaker in what’s been a long, bitter battle for creative control over his movies. Once he’d dried his eyes, it took four years for del Toro to pay back what he owed for Cronos – which he did with his fee for Hollywood bug-horror Mimic. His first studio film is, to date, the most unhappiest of his career. “Shooting Mimic was basically going through the equivalent of open-heart surgery without anaesthesia,” he recalls wistfully. “But I’m thankful for it. There’s a lot of lessons I learned. It widened my range of camera moves and storytelling – and this is a direct result of the studio telling me, ‘Move the camera around.’ You can learn more from a hard experience than a nice one, but for all those who think sacrificing a little bit of freedom for a lot of money is worth it, it isn’t.” For del Toro, the reverse was true: on his least favourite film, he’d still ponied up $120,000 to add extra effects shots. 5. His favourite movies include Viridiana , Greed, Frankenstein , Mad Max 2 and Great Expectations .